I am calling my challenge an "out-of-the-box" challenge. I think it's always awesome to get a little more mileage from our shapes and feel like we're getting a great bang for our buck so I would love to see all your ideas on how to uses Lori's shapes in ways other that how they were originally intended. Using a shaped card (as I did) as an embellishment on a layout. 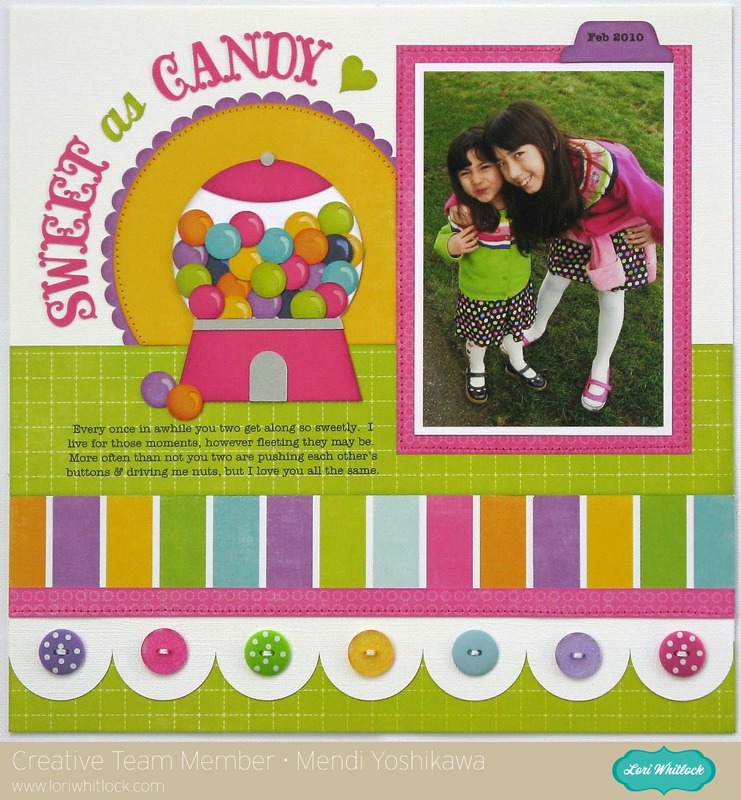 For my example I made a layout with a focus on Lori's darling Bubble Gum Machine Shaped Card which I used as a flat embellishment. As an added twist I used the shiny mark from her apple shape on each of my gumballs and then adhered a circle behind each with a coordinating lighter shade of cardstock. For my scalloped button border I used Lori's 3 Borders, duplicating and welding the largest scallop together and removing the inside cutouts. For the scalloped mat behind my focal point I reduced one of Lori's 12x12 Background Circles in size and also removed the inside cutouts. For my date tab I used Lori's 8 Tabs and just removed the inside cutouts before cutting. I finished off my layout using Lori's adorable Vintage Font for my title. I love that with a little clever thinking I can get so many different looks with Lori's awesome shapes! LOVE this layout! I love everything about it, the colors, the layout, the adorable photo and LOVE that gorgeous font! Absolutely wonderful! Love the photo and the die cuts you used!